How One Dad Teaches His Kids About Entrepreneurship | Shafer...Power! A fun article by Lynne Strang documenting the journey of Shafer…Power. Thank you Lynne! 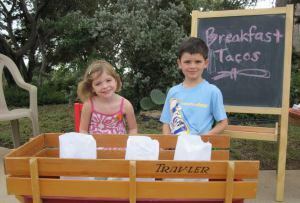 Malia and Owen Shafer with their taco wagon. After graduation, he set aside his entrepreneurial aspirations for a sales career that took him to British Airways and Dell, among other places. He and his wife, Kathleen, became the parents of two children, Owen and Malia.